I've had a great time so far this summer partnering with Adobe as a Photoshop Elements ambassador, and I'm excited to team up with them again today to bring you guys another tutorial! For my first tutorial in this series, I showed you how to give your photos a dreamy, summertime-inspired look using the lens flare filter in Photoshop Elements. One of the things I mentioned was that a lens flare often occurs unintentionally when taking photos, yet it can end up creating a really magical image. So for today's tutorial, I thought it would be fun to demonstrate how to replicate another often unintentional photographic effect that, like the lens flare, can transform ordinary images into unique works of art: the double exposure. The double exposure is something we don't often see in the digital world, but in the days of analog photography and manual winding cameras, it wasn't a rarity. The concept is very simple: when a piece of film is exposed twice to two different images, the second image is superimposed onto the first. Usually this isn't the desired outcome, but sometimes the effect can be really fascinating and quite lovely. The images above are the result of unintentional double exposures on 120 film. My husband and I were playing around with our Holga camera for the first time a few summers ago, and didn't realize we'd taken a few multiple-exposed shots until after the film was developed. Although the photos aren't technically perfect by any means, we both loved the unique aesthetic that was created by the combination of images. 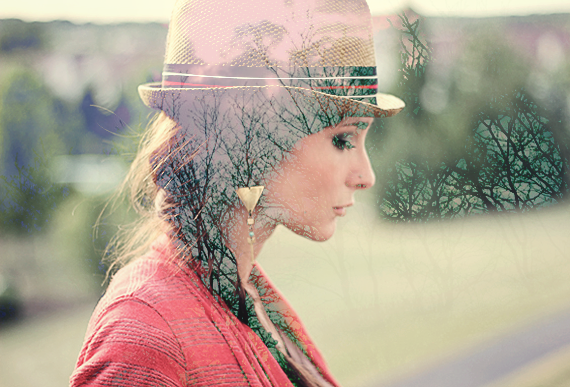 These days, you don't need a film camera in order to produce a double exposure style image. 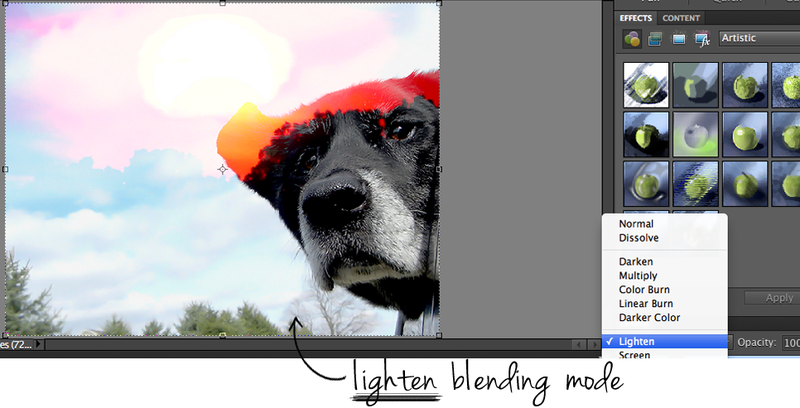 In fact, in a few simple steps in Photoshop Elements, we can create the same effect - but with a lot more control. As with my last tutorial, when you're going through these steps, keep in mind that there are no right or wrong adjustments, levels or tweeks. 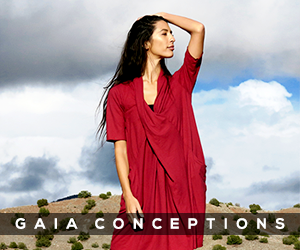 When choosing which images to combine, try to envision whether or not they'd flow together visually. I usually like to choose a landscape or wide angle shot for the background, and a portrait or image with a focal point of one specific subject to stack on top. 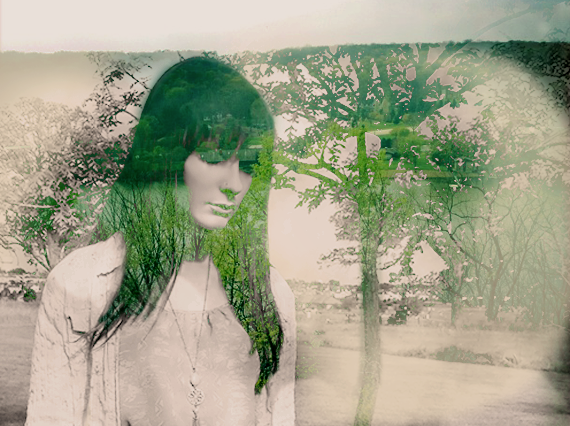 But it can look just as cool to use two landscapes or two portraits together. The best way to go about this is to experiment, be creative, and have fun. *For larger views of screenshots, click on the images. 1. 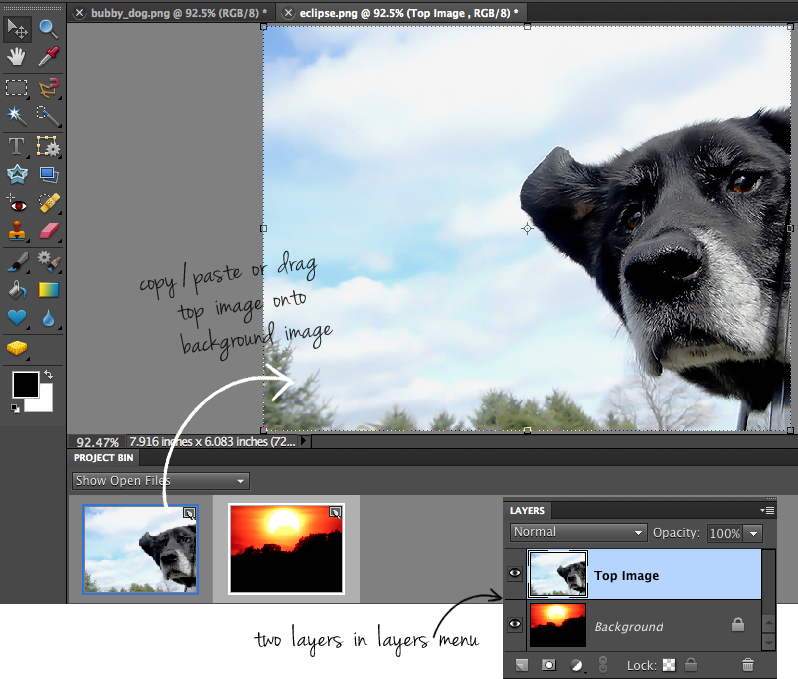 Open your two image files in Photoshop Elements (File > Open for each image). 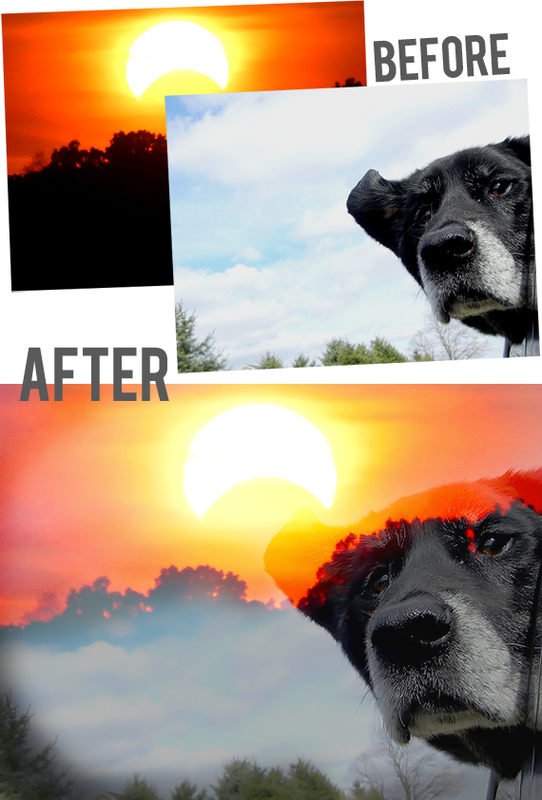 I'm using a picture I took of Bubby dog for the top image, and a picture I took of the recent eclipse for the background. 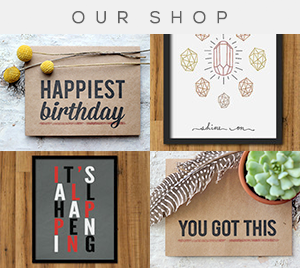 Tip: Make sure to edit your images so that they're the same size, if they're not already. 2. Copy the photo that will be on top onto your background photo (Edit > Select All > Copy > Paste), or just drag the top image from your Project Bin up to the background image in your Editing Window. You'll now have two layers in the Layers menu. 3. 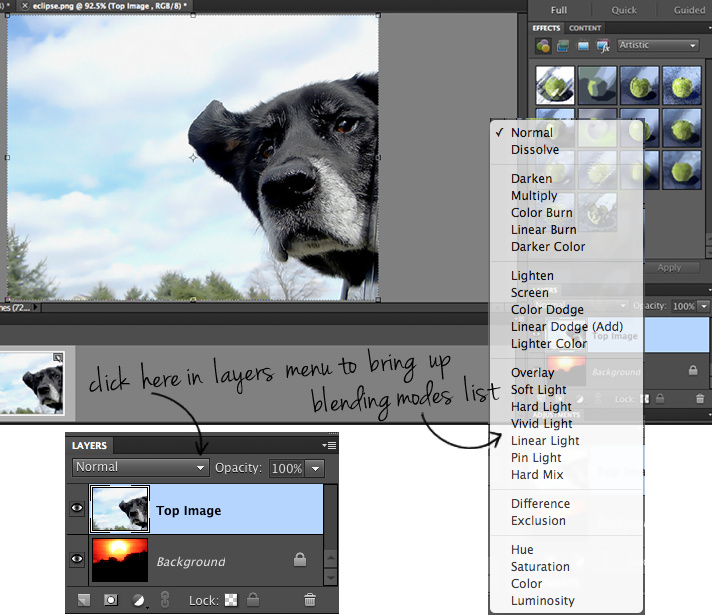 Select the top image in the Layers Menu, and click the down arrow next to 'Normal' to bring up the Blending Modes list. 4. 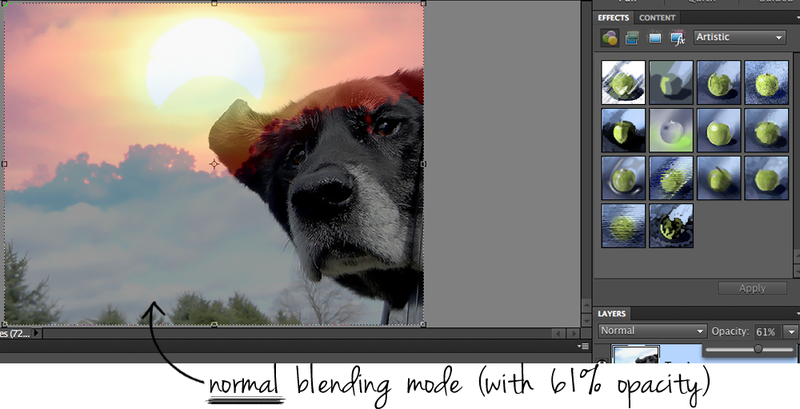 Choose a Blending Mode. You have several options here, depending on the look you're going for. I usually prefer to choose either Screen or Lighten. You may also decide to keep it at Normal and reduce the opacity by clicking the down arrow to the right of 'Opacity' and moving the slider to the left. The images above show variations using all three of these options. 5. Review your image. If you're happy with how your image looks, you can flatten (Layer > Flatten Image), save (File > Save), and you're done! (Yep, it's that easy!) But if you want to have some fun, try playing around with some of the other editing features that Photoshop Elements has to offer. As you can see, I decided to go with the Screen Blending Mode. I liked the aesthetic of this mode, but I felt like the final image was a little overexposed, and I wanted to see the two photos blended together a little more. I'm going to show you guys three more optional edits I decided to make on this particular image. But remember - there is no right or wrong here. It's all about experimenting! 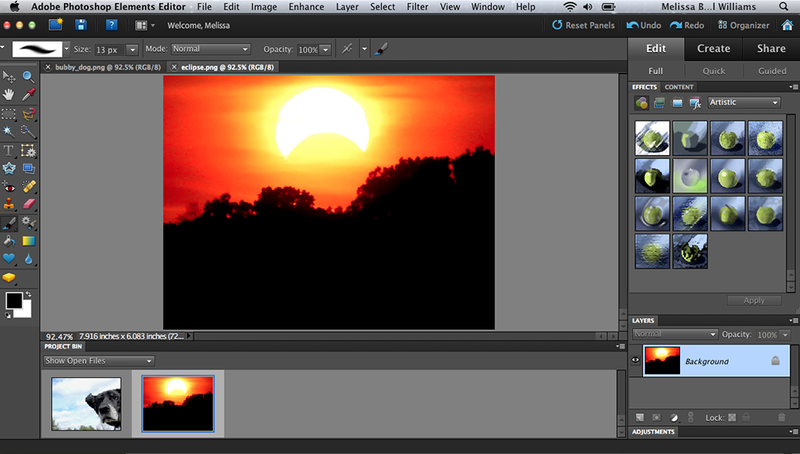 Optional Edit 1: Adjust Layer Opacity. 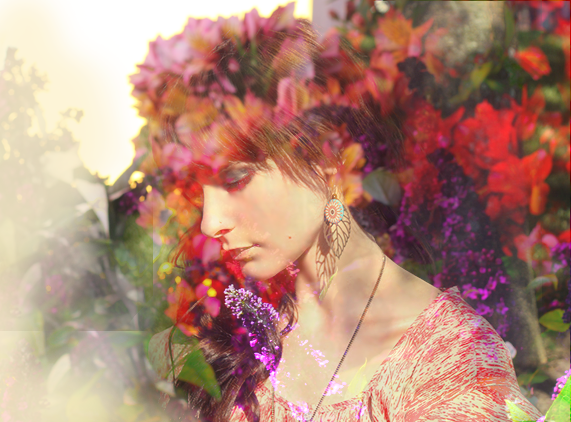 Because I wanted to create more of a flow between my two images, I decided to make the top layer more transparent. 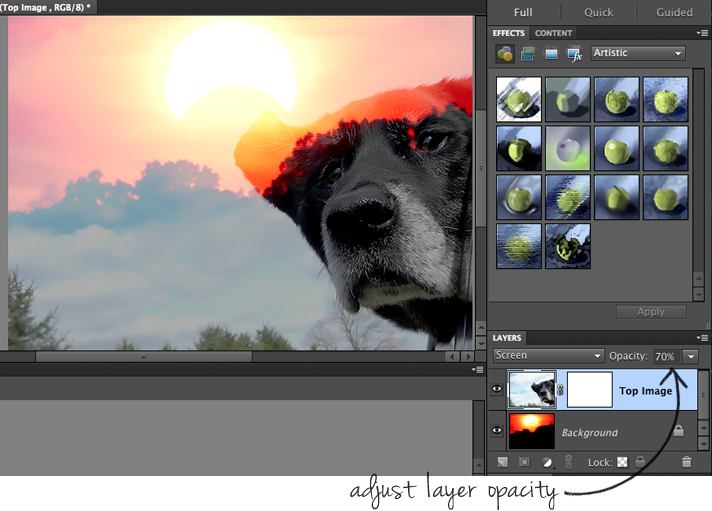 In the Layers Menu, I selected the top layer, then reduced the opacity using the slider. A. Add a Layer Mask. 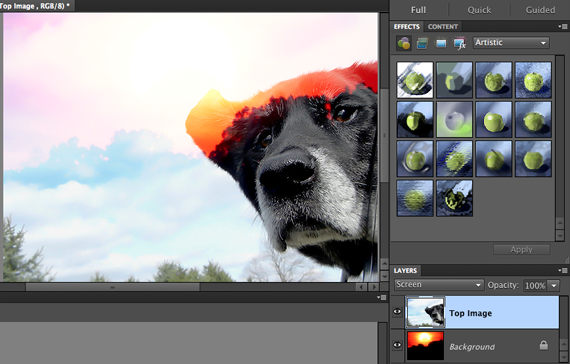 To give myself a little more control over how the images were blended, I added a layer mask. I'll admit that I don't use the layer mask technique all that often, but it can be pretty incredible tool. Basically, a layer mask allows you to choose parts of a layer to hide while allowing other parts to show through. To do this, I selected my top layer, then clicked on the Add Layer Mask icon at the bottom of the Layers Menu (1). B. Paint Layer Mask. Next, I painted the layer mask black to reveal more of certain portions the background layer. To do this, I selected the Brush Tool from the Toolbox Menu (2) on the left side of the screen, chose black for the Foreground Color (3), chose a soft Brush from the Brush Menu (4) on the top left, chose a Brush Size (5), and set the Opacity (6) to 30%. I then painted over the image in the places where I wanted to reveal more of the background layer. 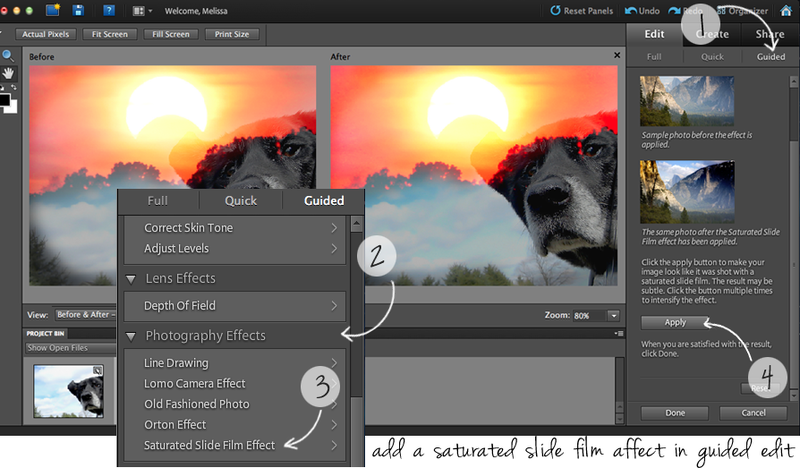 Optional Edit 3: Use the Guided Edit Menu to Add a Saturated Slide Film Effect. Because the background layer of this image features a very vibrant sunset, I decided I wanted to play that up and give the final image a boost to make it really dramatic. First I flattened my two layers into one (Layer > Flatten Image). Then I decided to take advantage of the Guided Edit feature of Photoshop Elements by clicking on Guided Tab of the Edit Menu (1) and scrolling down to Photography Effects (2). I then clicked on Saturated Slide Film Effect (3) and clicked Apply (4). You can choose to click "apply" multiple times to intensify the effect, but I chose to click it just one time and keep the results subtle. 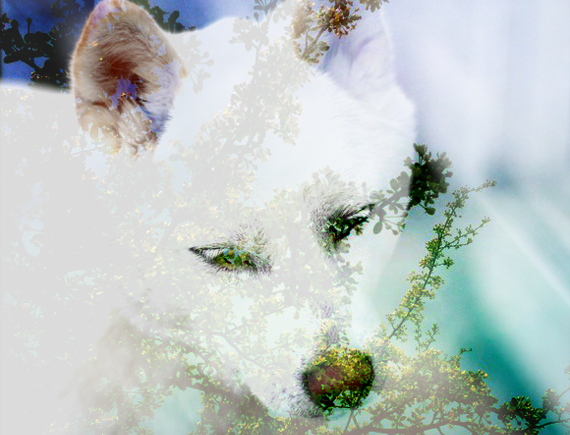 After playing around with the optional edits outlined above, I saved my final image (File > Save As), and my double exposure photograph was complete! Here are a few additional examples of images where I used the same techniques in Photoshop Elements that I outlined in steps 1-5 above. For some of these I also used some of the optional edits I explained above, and for others, I played around with different features within Adobe PS Elements to come up with different results. I hope you guys enjoyed this tutorial, and that you have fun creating these artistic double exposure effects with your own images. 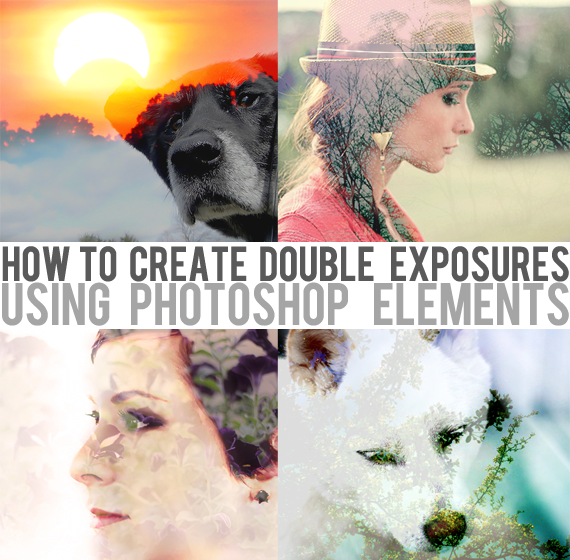 Let me know if you have any questions, and of course, if you try this tutorial yourself, I'd love to see your photos! To read more about my role as a Photoshop Elements Ambassador, click here. To view my first tutorial in this series, click here. In addition to here on the blog, you can follow my PS Elements Ambassador adventures over the next few months via my Twitter and Instagram (@bubbyandbean) accounts. You can also keep up to date with the project and other Photoshop Elements goodness by visiting Adobe Photoshop Element's Twitter, Facebook, Pinterest, and YouTube accounts. Woah--what an awesome tutorial! I seriously can't wait to try this out! Love this, amazing! Fun tutorial cant wait to try out. This is an amazing tutorial - thanks!! this is so cool. 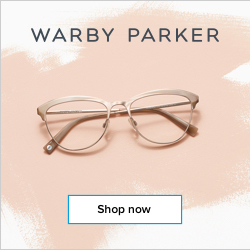 can i order photoshop elements online? These photos are so beautiful and inspiring! Very well explained tutorial too. I can't wait to get home from work so I can try it. Digital double exposures are all the rage lately. I keep seeing them everywhere. I have a few old-fashioned double exposures still from when I used film cameras. Now I basically just use my digital camera all the time, but there's nothing like the accidental magic that happens with film! Very useful, thank you! Gorgeous end results too. Looking forward to trying this. Great tutorial! I can't wait to try this out! I just bought myself (okay, so in reality my husband bought it for me) a Holga, mainly for the reason to play around with double exposures. 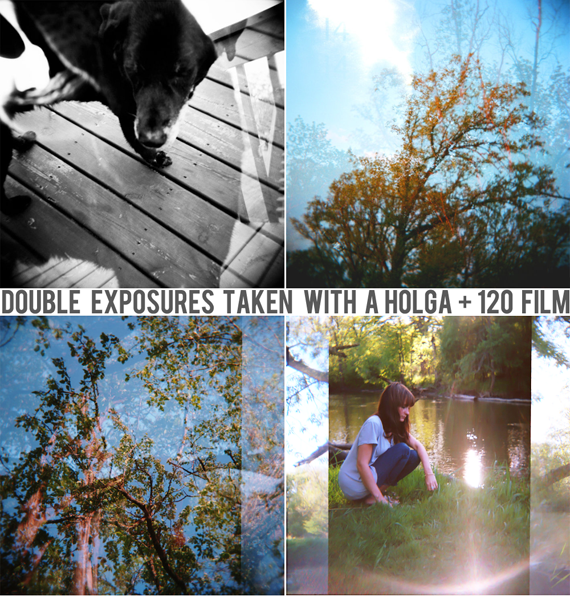 I feel I'll be able to learn more about the nature of double exposures the more I play with my Holga. I do it with my digital photos in photoshop at times, especially for some of the professional graphic design work that I do... and your tutorial is great. It's an art and style that should never be lost! 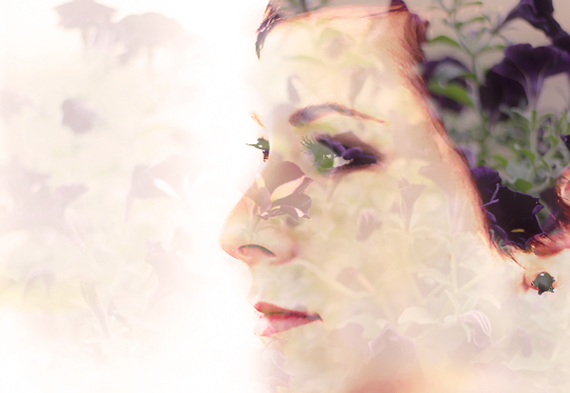 i forgot how much fun double exposures are. totally making one right now! xoxo. 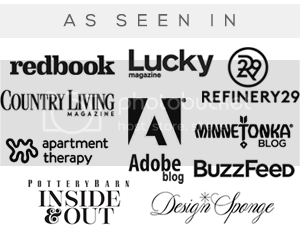 I found your blog through Lucky Mag, this is really cool. Looking forward to trying it out with my pics. This is such an awesome tutorial! This is an amazing tutorial. Your photos are absolutely stunning. I tried it today with two photos of my children. They came out amazing. Thanks for sharing this. This tutorial is amazing. Your photos are absolutley stunning. They truly inspired me. 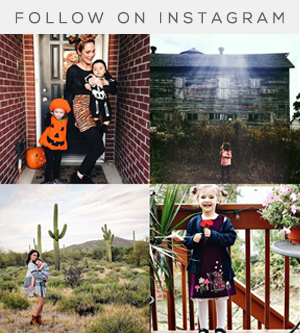 I tried with a couple of photos of my kids. I did one of my daughter with a bunch of flowers as the background and I love it. Thanks for sharing this. The photos you edited were amazing. I did a google search and found you! This tutorial helped me so much. I am now a new follower of you. Hi there! This tutorial is exactly what I was looking for! However, whenever I try to drag the top layer onto the background, the top picture is small compared to the background -- even though they are both the same sizes. So the top layer sits on top of the background a fraction of the same size. I would like to say thanks for photography tips. Anyway I enjoyed this wonderful article for such wonderful photos. Looking forward more! Can i apply that step on Photoshop CS5? Hi Kiki, which step? Although this tutorial is specifically for PS Elements, you can probably tweak it to work for PS5 as well. Several steps and I hope I ca make it.